Evidence suggests that the claims process may urge policyholders to shop for a new carrier. Boston, March 7, 2017 – The moment of truth for any property and casualty insurance policyholder is being made whole in the event of a loss. Yet for many policyholders, the path toward getting made whole is filled with obstacles, many of which are put in place by their carriers. While most policyholders who have filed a claim are generally satisfied with their claim’s outcome, are a significant number of these policyholders still likely to switch carriers within a year of having their claim settled? This Impact Report explores the myriad issues policyholders around the world face over the course of the claims process, the developing trends driven by key claims stakeholders, and the technologies that are emerging in support of these trends. It is based on 43 Aite Group interviews conducted between December 2016 and February 2017 with industry practitioners from the United States and Europe. 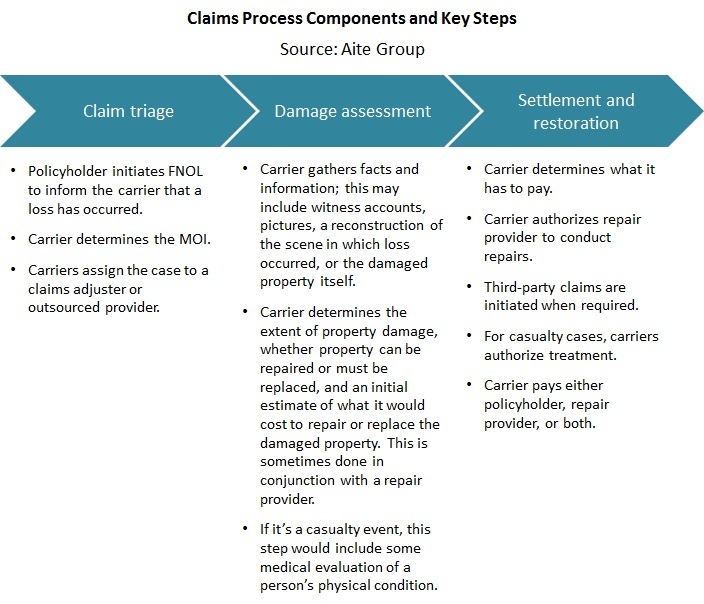 The report profiles 30 firms that are currently helping carriers update their claims processes and recognizes six vendors that also demonstrate a clear dedication to the insured. It profiles the following firms: AutoClaims Direct (ACD), BAE Systems, Casentric, CCC Information Services (CCC), CoreLogic, DataRobot, DropIn, Donan, edjuster, Enservio, Equian, Featurespace, Innovation Group, Insurity, Itel, iWE, Livegenic, Mitchell, n2uitive, Pegasystems, RightIndem, SAS, Shift Technology, Solera, Snapsheet, Symbility, Tyche Risk, UpdatePromise, Valen Analytics, and Xactware. This 63-page Impact Report contains three figures and three tables. Clients of Aite Group’s P&C Insurance service can download this report, the corresponding charts, and the Executive Impact Deck. This report mentions Accel Partners, Accomplice, Accurence, Allstate, Amazon, Appian Ventures, Atlas Venture, AutoClaims Direct (ACD), BAE Systems, Baring Capital, Ben Franklin Technology Partners, BuildFax, Cambridge Angels, Cambridge Capital Group, Carlyle Group, Casentric, CCC Information Services (CCC), Claimforce, Commerce Ventures, Core Capital Partners, CoreLogic, DataRobot, Digidentity, DropIn, Donan, edjuster, Elaia Partners, Enservio, Eos Venture Partners, Equian, Equifax, eviid, Featurespace, Fosun Group, 500 Startups, F-Prime Capital Partners, 4sight Business Intelligence, 470 Claim Management Innovation Group, Iris Capital, Genstar Capital, IA Capital Group, IBM, Imperial Innovations, Insurity, Intact Financial Corporation, Intel Capital, Itel, iWE, Koch Equity Development, Liberty Mutual, Liberty Mutual Strategic Ventures, Lightbank, Livegenic, Microsoft Accelerator (Paris), Mitchell, National Endowment for Science Technology and the Arts, National Water, Netflix, New Enterprise Associates, New York Life, n2uitive, OCA Ventures, Pegasystems, Pritzker Group Venture Capital, Property Damage Appraisers, QED Investors, RAW Capital, Recruit Strategic Partners, RightIndem, Right Side Capital Management, SAS, Shift Technology, SightCall, Solera, Snapsheet, Startupbootcamp, Symbility, Techammer, TechStars, TTV Capital, Tyche Risk, UpdatePromise, USAA, Valen Analytics, Vista Equity Partners, Wenalyze, and Xactware.